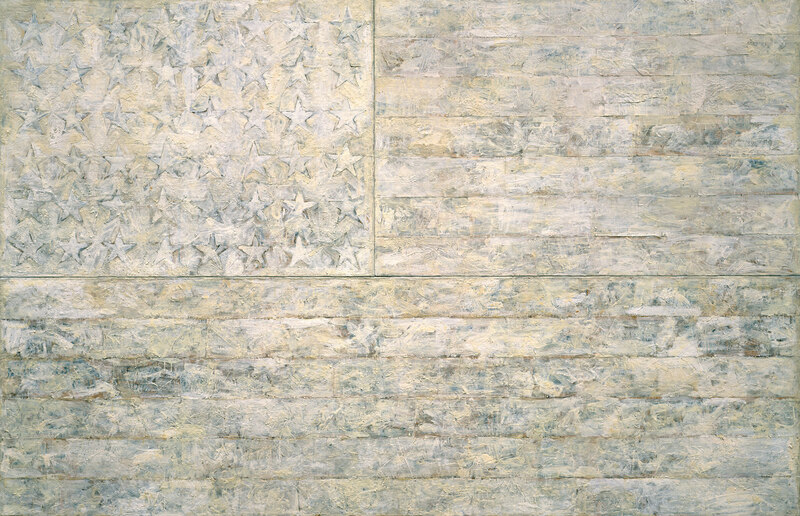 I found out that Jasper Johns has new work on exhibit at MoMA (Museum of Modern Art) and got all kinds of excited. And since I touched on artists who work and find success well into their advanced years recently (Maria Lassnig) I thought I would provide another example an artist pursuing his craft well inot his twilight years instead of retiring. “Regrets” 2013. An altered photo from a Christie’s catalogue. In the photo a younger, Freud, then in his 30s, sits perched on a bed raising an arm to hide his face. British photographer John Deakin took it around 1964 as part of a series commissioned by Francis Bacon, wanting to use the images as source material for his own paintings. Over the years, Bacon took that photograph of Freud on the bed and folded it, tore it and creased it until a pronounced dark patch dominated its foreground. Eventually Christie’s got a hold of the tattered image and shortly after Johns saw it in their auction catalog. The photo became the focal point of his latest project, inspiring him frays, creases, black patch, and all. But in true Post-Pop fashion, Johns tore the image out of the magazine rather then buy it himself, and proceeded to trace, copy, mark up and in all possible ways obscure it into near abstraction. He also played with the negative of the dark patch to contrast the positive space, all while incorporating layers of his signature themes like crosshatching, numbers, gray palette and wire mesh. A signature of his work is simplicity that downplays the elaborate nature of his working process. Ok, so now for a little history on Johns. A native of the South, Jasper Johns was born in Augusta in 1930, and raised in South Carolina. From the young age of five he knew he was going to be an artist. He attended college at the University of South Carolina at Columbia for three years, leaving for New York in 1948 at his art teachers’ insistence he move there. Johns attended the Parsons School of Design for a semester and saw numerous exhibitions during this period. For a period of two years he served in the army during the Korean War, stationed in South Carolina and Sendai, Japan, only to once again return to New York in 1953. Johns soon became friends with the artist Robert Rauschenberg (born 1925), also a Southerner, and with the composer John Cage and the choreographer Merce Cunningham. During the mid-1950s, Johns along with Rauschenberg joined up with several Abstract Expressionist painters of the previous generation, Jackson Pollock, Willem de Kooning, and Barnett Newman to name a few. During this time Johns grew frustrated with the results of Abstract Expressionism deciding that improv painting had arrived to all possible conclusions; or at least he appeared to become bored with where the technique was heading. Ever the control freak, Johns refocused on the the deliberate abstraction of widely available concrete subjects like printed media, or as he explains “things the mind already knows.” He became famous for repurposing quotidian icons of American culture; such as flags, targets, stenciled numbers, ale cans, and, slightly later, maps of the U.S especially the American flag during the 50s. The difference between Johns’ new painting style and Abstract Expressionism is that Johns stressed conscious control rather than spontaneity thus revolutionizing the allover compositional techniques of Abstract Expressionism. Johns’s new style engendered a number of subsequent art movements, among them Pop, Minimal, and Conceptual art. Johns’ early style is perfectly exemplified by the reserved, but lush large monochrome encaustic painting White Flag of 1955. The simplicity of this piece understates the meticulous and great amount of work Johns put into the piece rendered of beeswax on cotton panels he stretched himself. Throughout his career, Johns incorporated certain marks and shapes into his art that clearly display their derivation from factual, unimagined things in the world, including handprints and footprints, casts of parts of the body, or stamps made from objects found in his studio, such as the rim of a tin can. This latest series of work seems to be a continuation of his exploration in abstracting concrete printed media in new and innovative ways. I was able to find two more images of works from the show, but for now much of it is being kept secret for the opening; which was March 15th. So there should be more information available soon.